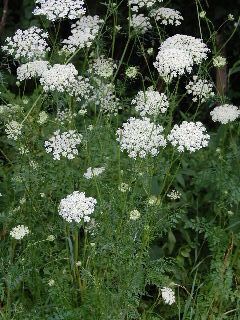 Queen Anne’s lace is a plant named for and identified by its distinctive bloom. We could talk about its taproot, which is indeed an edible wild carrot—hence the scientific name (Daucus carota). Or we could talk about its fern-like velvety foliage, which is also an identifying characteristic. But, hey, the large flower heads (which are clusters of smaller flowerets) do look very much like delicately woven soft white lace. So let’s go with the flow (or flower?) and admit that its name suits it just fine and makes it easy to identify in the wild. The plant is native to Europe and parts of Asia, but it has been naturalized to most of the temperate regions of the United States. Because it reseeds itself naturally and can invade pasture lands and farm fields used for the cultivation of agricultural crops, it is considered an invasive weed by the commercial agriculture community. However, home gardeners have discovered that Queen Anne’s lace can actually be a desirable companion plant for tomatoes and other vegetable crops. Here’s how that works. The velvety white blossoms attract aphids and other undesirable insects intent upon ravaging the gardeners green and growing goodies. However, predators of the aphids are also drawn to the garden because of the Queen Anne’s lace and its accompanying meal of aphids and other scoundrel-like bugs. Thus, the aphids get eaten before they can eat the produce! Queen Anne’s lace is also desirable in the home garden because its large white blossoms attract butterflies and bees. Another tiny insect that is attracted to the blooms of the plant is the chigger, a very small reddish varmint that can cause itching and irritation of the human skin. A childhood memory is of the adults telling us kids to avoid rubbing against those “chigger weeds” while we were playing outside! 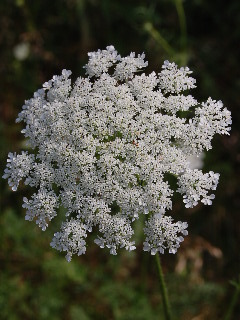 Somehow, the rural slang term “chigger weed” just doesn’t sound as desirable, noble, or pretty as the gentler, more flowing, and more commonly accepted designation of Queen Anne’s lace. The plant is defined as a biennial, meaning it lasts for two years. During the first year after the seed germinates, the plant grows but does not bloom. It is during the second year of the plant’s growth that the characteristic white blooms appear. We want to caution that even though the taproot is considered an edible wild carrot, never, never, never consume any part of any plant gathered from the wild without being positively assured by an expert in this field that the plant is not harmful to humans! Enjoy Queen Anne’s lace for what it is—another pretty wildflower in the landscape.